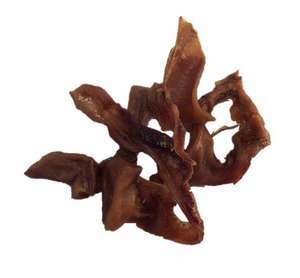 These natural baked Pigs Ear Strips offer a tasty, crunchy snack for any good dog! These natural meat treats are made from 100% quality Irish pork, oven baked to create tasty Pigs Ear Strips. With a satisfying crunch these are sure to become a favourite. These natural strips of pigs ear contain no nasties, additives, bleaches or dyes and make a great reward for any dog. Available in packs of 100g, 200g or 500g. If your require a different quantity please get in touch.